Sredojevic and his players will be hoping for a change in fortune when they meet Bloemfontein Celtic at the Dr Molemela Stadium on Sunday. Orlando Pirates coach Micho Sredojevic says he knew Bidvest Wits would try to limit the Buccaneers’ attacking options after the Clever Boys emerged 1-0 winners in an Absa Premiership clash at the Orlando Stadium on Wednesday night. A resolute Wits defence managed to keep Pirates from scoring despite Sredojevic’s side having most of the possession. 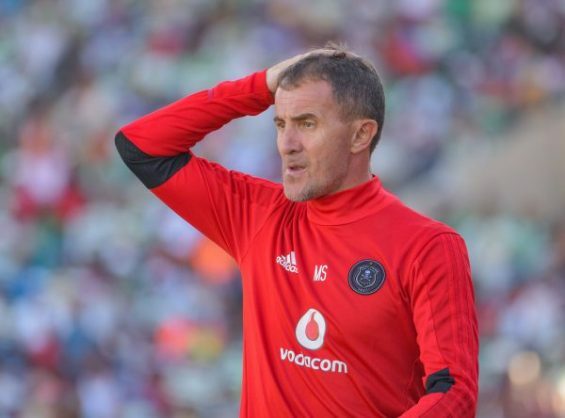 The defeat was the second in four league and cup games this season for Sredojevic, who was desperate for a win after Bucs’ exit from the MTN8 Cup against SuperSport United last weekend. “We knew our opponents would line up with a defensive approach. We were looking for a situation that would put us in a position to try and be patient against that strategy and create because their system is mainly directed at limiting the other team’s chances,” Sredojevic explained. Wits’ goal came through a Gladwin Shitolo own-goal after Haashim Domingo’s cross deflected off him and wrong-footed Bucs keeper Siyabonga Mpontshane before skidding into the net, leaving the coach shaking his head. It was the second own-goal for the defender after he was also responsible for Highlands Park’s goal in the 1-1 draw in their opening game of the season. Bucs are in sixth place with four points, made up of a draw, a win and a defeat. The way things are going at Pirates left Sredojevic asking himself questions while believing his side deserved to beat Wits.